"I can’t wait until you get over this healthy food phase of yours…and start blogging about things like bacon fried in duck fat covered in chocolate again." Those words were uttered to me in an IM last week by a friend and reader of this blog. The words "healthy food phase" came across loud and clear – I could hear the hiss of those three little words all the way over the Internet. I get it. Sheesh! Yes… I do tend to focus on healthier things here on the ‘ol blog. My natural tendencies and cravings lean towards veggies – along with cheese and bread but that’s not important here. Especially when cooking for one, I tend to do simple dishes, salads and easy pasta dishes. That having been said, every once in a while, I get the hankering for something sweet. While I think the whole cupcake thing is a little overdone at this point, I do make a mean one. I have seen friends of mine eat six or eight in one sitting. In the car. Right after I hand them the box. My specialty is chocolate cake with a whipped, airy vanilla frosting. They’re pretty spectacular, if I do say so myself. For Top Chef Wednesday this past week, a group of us got together to cook and watch the show. The theme? Belated Cinco de Mayo. It was the perfect occasion to surprise the group with cupcakes, something I hadn’t done in a long time . I wish I could take the credit for this one…but I can’t. I blended two different recipes together to make the cakes – a vegan cake recipe and a decadent cream cheese frosting to top it. The light cake had nice tangy taste…but for me, the cake is really just the vehicle for the frosting and this recipe did not disappoint – creamy, rich and not too sweet. – Preheat oven to 350F. Fill a 12-cup muffin tin with liners. I like margarita flavoured things, (like cupcakes) better than I like margaritas themselves. These look great! 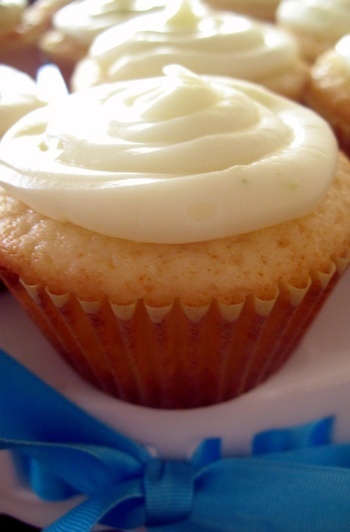 love the idea of margarita cupcakes, perfect for a summer night! yours look delish! Oh yum! I love boozy cupcakes. “Bacon fried in duck fat covered in chocolate” – your friend is hilarious! But nice post. These look lovely! And what a fantastic picture (very appetizing in itself). I think I’ll try them out very soon. I thought I was in love with you before . . . but now that you’ve jammed cupcakes and booze together in one beautiful dessert . . . I’m absolutely certain that I’m in love with you!